The Schumin Web » The weather held out, though it looked likely to rain at any moment. 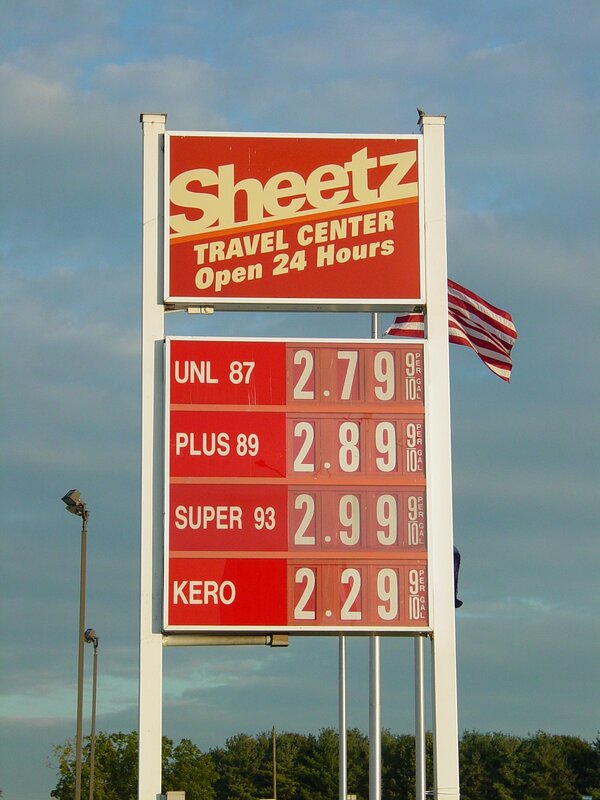 Look at the prices at the Sheetz in Mt. Jackson! This was the same at the Sheetz in Fishersville earlier the same day. Amazing how prices rose like that in less than 24 hours. It was $2.39 a gallon in Fishersville when I filled up the previous weekend. Then on Tuesday afternoon, when I topped off the tank before going to DC, it was $2.49 (which is where it was before I went on vacation last week). Then the morning of my trip, it was $2.79 a gallon. I took the photo of the sign out of shock, plus seeing a good photo feature right there. And that would not be the end of the gas prices’ rise, either (more on that later). Arriving at Vienna, I quickly found a parking space on the top deck. 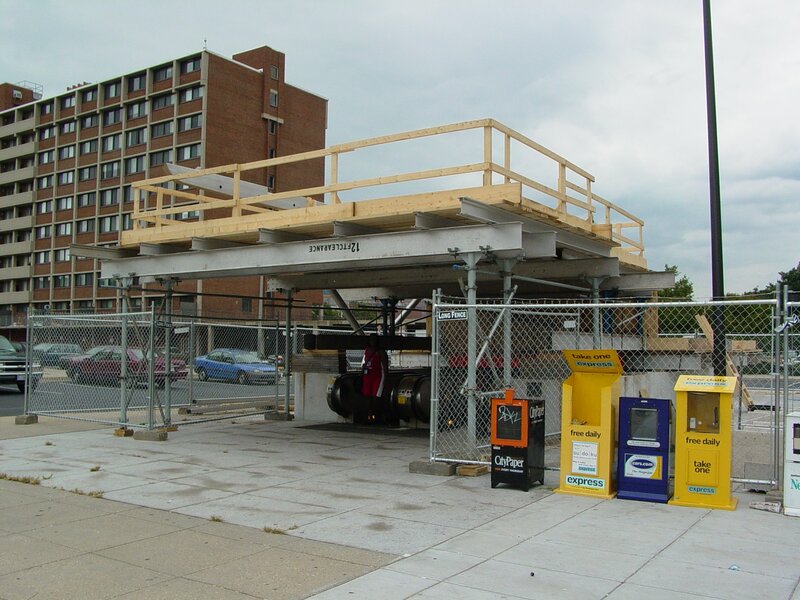 Thankfully, the crews involved in the ongoing rehabilitation of the parking garage have finished work on the first ramp, so now we have two ramps between levels again. Makes traffic flow up the garage much easier with two instead of one. Of course, considering the way they’ve progressed, with the work now going on in the section between the ramps, in another month or so, the second ramp will be closed for its own rehabilitation. Still, it’s nice to have both open again for now. Of course, at least this is a fairly big garage. It could be like the JMU parking garage, which, while it looks big, is actually a very tiny parking garage. 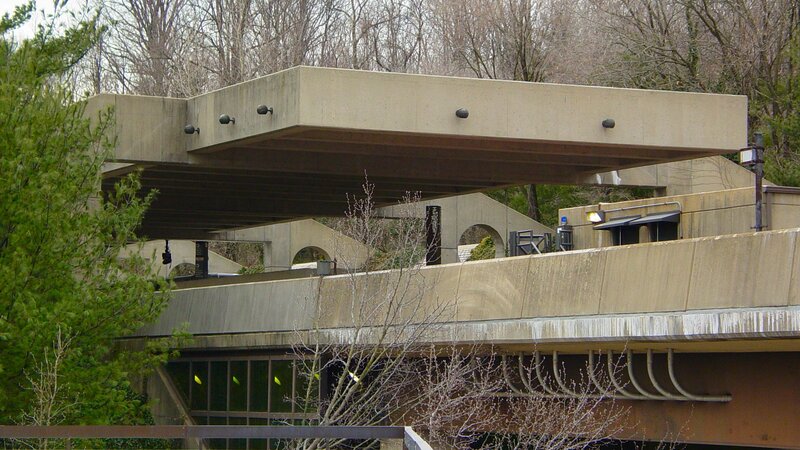 That garage, if you can imagine, has one way up and down – a single spiraling path to the roof. One side of the garage is the ramp, and the other side is flat. And since the turns are so sharp and also 180-degree turns, I consider it an accident waiting to happen. And any accident would jam up the entire garage. I’m just glad I don’t have to deal with it anymore, and never had to deal with it in a major way when I went to JMU. But back to DC. After my usual Rosslyn stop, I ended up going around to Metro Center, where I transferred to a Red Line train. I didn’t realize that Metro was doing mid-day track work, and so that was an interesting surprise. Thus instead of the short-turn trains terminating at Silver Spring, these trains were turning around at Brookland-CUA. I took a Red Line train to Brookland-CUA, where the train went out of service (to turn around). Then I caught a Glenmont train, and rode it past the track work (between Takoma and Silver Spring), and then the rest of the way out to Glenmont. Turned around, and rode back in, to Fort Totten. 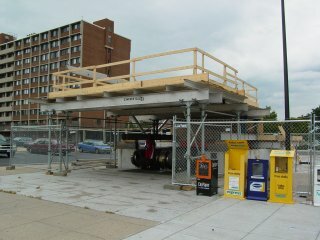 Transferred to an inbound Green Line train, and rode to Shaw-Howard University station. I just hope that the contractor at Shaw doesn’t stick his foot in his mouth with me like they did at Stadium-Armory back in March, where at that time, a person in charge was wondering if I was with anyone documenting safety violations, specifically mentioning “harnesses”. After that, I went to the Infoshop for some information about September 24th, and then from there got back on the train. Welcome to the delay, boys and girls. 3:10 p.m. Three outbound Yellow Line trains were significantly delayed because of a mechanical problem on the track. 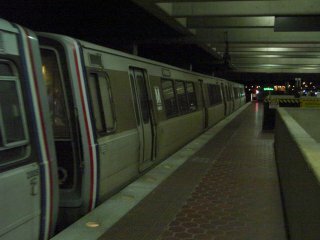 Three outbound Blue Line trains were turned back at Arlington Cemetery, and several trains were single-tracked around the problem. Service resumed after repairs were made. 4:48 p.m. An inbound Blue Line train was held at Stadium-Armory because of a sick customer. Service resumed after medical assistance arrived. Three trains were off-loaded and turned back for service, at Metro Center, Smithsonian and Stadium Armory. 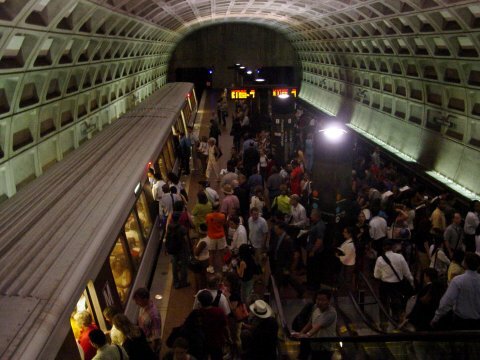 The first incident was described over the loudspeaker as a switch problem at Pentagon City. That put a bottleneck on the Blue and Yellow Lines, which share track at that location. Then the second incident, a sick passenger at Stadium-Armory (incorrectly announced as being at L’Enfant Plaza by the operator of the train I was on), affected the Blue and Orange Lines, which share track through Stadium-Armory. Then the Green Line was indirectly affected, because it shares track with the Yellow Line in downtown Washington. Thus I spent several minutes (though it felt like eternity) sitting on CAF 5150 at Gallery Place. I ended up getting off the train at Archives-Navy Memorial-Penn Quarter, and walked the two or so blocks to Federal Triangle. I did this because I was under the impression that the sick passenger was at L’Enfant Plaza and not at Stadium-Armory, thus trying to get around the problem by taking the Blue Line into L’Enfant and catching a train to go away from the incident, and into Virginia. And it looked like the clouds were ready to burst forth with plentiful rain at any moment. But they never did, thankfully. Yeah. Fun. I sat out two trains (one in each direction) on the mezzanine in hopes that it would thin out a little. Of course, not many were able to squeeze on beyond what was already on there. You can only squeeze so many sardines into the can, after all. I ended up taking Rohr 1234 back to L’Enfant Plaza and getting the Yellow from there. And the Yellow Line train was another sardine can right there. Due to the switch problem, it was slow going to Pentagon station. It was stop-and-go for much of the way. And if we weren’t stopping or going, we were crawling. Crawling over the bridge, and in the tunnel just north of Pentagon station. Then from Pentagon, it was no problem. At Pentagon City, I got off the train, and did my Pentagon City thing. Then after my Pentagon City thing, I went down to Huntington. I went down to the lower mezzanine and visited the Exeloo. Then I came back up to the platform. This attracted the attention of some Metro employees on the platform who proceeded to figuratively wet their pants when I started getting some stills of the train on the platform. I got the usual mumbo-jumbo from them, with their stating incorrectly that photpgraphy is prohibited, and citing 9/11. Like I said – the usual mumbo-jumbo. Having heard that one too many times after Richard White stated in a Lunchtalk chat that people are welcome to take photos in the system if they wish to, I challenged them on it. I specifically cited the April 15 Lunchtalk message to the employee involved. He got the rail supervisor working at Huntington. After I politely explained what was going on to him, he invited me to come with him so he could call Central Control and get the word from them. So we went into the little booth at the north end of the Huntington platform, seen off to the right in this photo, between the tracks. That’s a pretty cool little booth right there. One room, facing away from the station, is a breakroom. It’s got a TV, a table and chairs, and two water coolers. And also lots of memos and postings and such, both from Metro management, as well as from ATU Local 689, which is the union that represents much of Metro’s workforce. Then a second room, with a window facing the station platform, houses modern and also antiquated equipment regarding the position of trains on the railroad, the status of the interlocking that’s located just beyond the little booth that we were in. So he called Central Control. They wanted to talk to me. They asked me what train it was I was photographing. I told the truth – 8002 and 8003, former 1114 and 1115, aka the “money train”. The woman on the phone at Central Control said to stay where I was and hung up. I asked the rail supervisor what was going on, and told him what the lady at Central Control said. He said they were going to send a Transit Police officer over to check it out, and that they would probably want to see what I’ve taken. So we waited for a while. A train came in. I commented that I hope this gets taken care of quickly, as I’d like to be out of Huntington on that train. The officer had not shown up yet. The train, a consist of Breda rehabs, departed. I asked the supervisor if he could find out where the officer was. He radioed to find out. The officer just arrived. And in no time, the officer was on the platform. So we met him out there. Then the supervisor left the two of us to talk. From there, the conversation went off to discussing my camera (I even popped the back open and showed the CD inside), and our thoughts on buying electronic stuff. I explained my philosophy – buy top-of-the-line equipment and then use it until it dies or no longer keeps up. After all, I’ve had Big Mavica for almost three years, and my current computer for more than seven, and no plans to replace either at this time. So life was good. From there, I rode the next train out of Huntington to King Street, where single-tracking was going on due to canopy construction. Then from there, I caught the next Blue Line train, and then quickly made my transfer to Orange, and it was back to Vienna for me. The trip home was, to put it nicely, awful. I-66 westbound will be closed overnight for a while, and so VDOT set up a detour via various local roads around the four-mile stretch of highway that was closed. The detour began at Exit 47A, and cars were routed north of the highway and then west. The detour rejoined westbound 66 at Exit 43. Right after that, more stuff going on – a resurfacing project shut off the left lane, and also encroached on the right lane, sending the traffic onto the shoulder to drive. Then it was smooth sailing to Haymarket where I did my Sheetz visit. Then from there, I made it to Woodstock (where I stopped at Wally World for a pit stop), and then continued a little further out. I passed the Sheetz in Mt. Jackson (I didn’t stop), and noted the price of gas on the big sign visible from the highway. 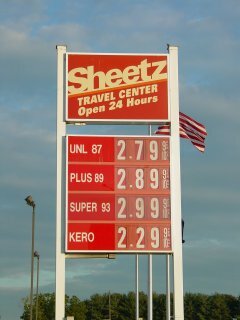 $2.99 a gallon, up from $2.79 that morning. Yikes! This turned out to also be the price in Fishersville, too, for that matter. And then it was back to my nap. And upon waking up, I walked around for a few minutes to make sure I was fully awake before again taking to the highway, and then I was off, and went straight home. All in all, I had fun, but the price of gas is obscene. The phrase, “Just plunge a dagger into my wallet, why don’t you?” comes to mind. Song: Pocket Monsters: Torikaekko Please, which translates to "Let's Trade Please". I have referred to this song as "Suzukisan" in the past, but this is the official title of the song. Quote: "So how's it feel being a sardine?"